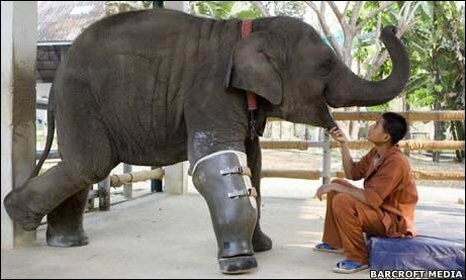 An elephant in Thailand has been fitted with a new false leg, after outgrowing her original prosthetic. Mosha, 3, lost part of her right front leg as a seven-month-old when she stepped on a landmine. She was taken to an elephant orphanage where staff initially thought she might die, but an amputation expert fitted her first leg and she recovered well. Now eating 90kg (200lb) of food a day, Mosha was doing so well she needed the upgrade, and may live for many years. When Mosha was brought to the Friends of the Asian Elephant (FAE) hospital and sanctuary in Lampang, northern Thailand, she refused to eat. But a specialist in helping human amputees, Dr Therdchai Jivacate, thought he could help and designed an artificial limb for her. "When Mosha first saw her artificial leg she was scared of it," said one keeper. "But as soon as the doctors put it on and she could put some weight on it, she didn't want to let them take it off." The new leg enables Mosha to rest her weight comfortably, but it can still be easily removed. She has been accepted by the other elephants and appears to be thriving in the sanctuary. "She has grown in confidence and now likes to play with the others," said FAE founder Soraida Salwala. "Mosha should live many long, happy, elephant years." Thailand's borders with Burma and Cambodia are littered with unexploded landmines, the result of decades of conflict. The FAE say many elephants, often domesticated ones used in the logging trade, are injured by mines every year as they work in remote forests close to the borders.